Among the columns of the DMV sys.dm_os_wait_stats are ones called wait_type, wait_time_ms and waiting_tasks_count. These three columns represent the wait type, the total number of milliseconds that have been spent waiting on this wait type, and the number of times this type of wait has occurred, respectively. Wait types that associate with latches start with LATCH_, PAGELATCH_, or PAGEIOLATCH_. Dividing the total wait time by the number of waits will give an average wait time (I’d recommend wrapping the waiting_tasks_count column in the NULLIF function to avoid a division by zero error). By querying this DMV repeatedly over time (as in the following example, code file Ch7Symptoms.sql, further illustrated in Figure 4), a picture can be built up of the frequency of latch waits, along with the amount of time the system must wait for these latches. This picture allows a database administrator to understand what kind of behavior is being exhibited — whether it matches Figure 1 or Figure 2. The DMV called sys.dm_os_latch_stats lists similar statistics for latch classes. For the time being, you can think of a spinlock as a latch, except that if the memory needing access is not available, the spinlock will keep checking it (known as spinning) for a while. There is slightly more to it, but that will be kept for later in the chapter. 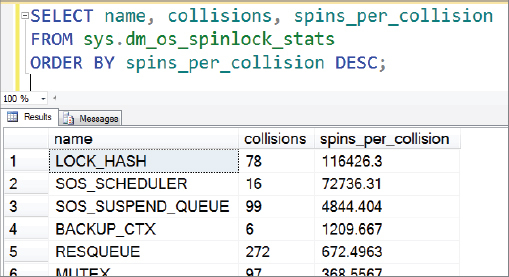 The sys.dm_os_spinlock_stats DMV can also be cleared using DBCC SQLPERF. Locks are used to maintain the ACID properties of a transaction, but latches are used to provide consistency over a memory operation. A spinlock should be considered as similar, in that a resource is needed for a particular operation, but is not available. Therefore, when you see higher than normal wait stats associated with latches and spinlocks, you may need to investigate further. However, only seeing higher than normal wait stats does not in and of itself indicate a contention problem. It is perfectly reasonable to expect that if your system is busier now than when you took your benchmark, your wait stats would be higher. You should look for the proportion of wait stats compared to others, and compare this to the throughput being achieved. You might also want to consider how many transactions per second you’re managing to achieve as you increase the load, and the effect of extra processors. One strong indicator of latch contention can be seen when the proportion of latch-related wait stats increases unreasonably as your throughput increases, as shown in Figure 2. For spinlock contention, a strong indicator is the number of spins per collision increasing, typically combined with increased CPU. Spinning is an activity that requires CPU effort, so if spinning increases disproportionally, CPU is likely to do the same. CPU may go up simply because of a busier system, but if the transactions per second counters are leveling off while CPU is increasing, then this would suggest the CPU is being used for something else — such as spinning. This is the behavior shown by the graph in Figure 3.